Did you miss the first article in this series? Read about how to be like Elon Musk here. Do you wish you knew what to do with it to develop it into something people want? Maybe it's time you became a builder. A builder is any self-motivated person or entrepreneur who wants to build something new to meet a customer demand or something unique that creates a customer demand. It may be building a small business, a social enterprise, a community think tank, a high-growth technology venture or a new division in an established organization. Whatever it is, to succeed, it will take vision and action -- and most importantly, the first key: self-awareness. How do you think and make decisions? How much does failure hurt you -- or does it? What resources can you count on when the going gets tough? 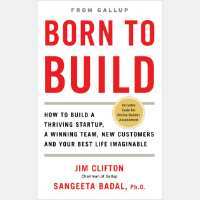 Gallup identified 10 common traits that successful builders share. When builders understand these traits (self-awareness!) and know how to apply them, it significantly improves their chances of success. You possess some of these traits, too. But you probably don't know it yet. So to help you identify your unique mix of these 10 talents, Gallup created an online assessment called the Builder Profile 10 (BP10). Use the access code in the new book, Born to Build, to complete the assessment or purchase a code online. It's important to know your top four talents from the list of 10 -- they're your strongest and most dominant talents. Each talent is highly relevant to specific business outcomes. For instance, builders with high levels of Disruptor are more likely to move their ventures in a new direction, but less likely to focus on profitability. Those with high levels of Risk are more likely to chase revenue, but on the other hand, less interested in building efficiencies into the venture or putting processes in place to scale the venture. The way you're wired will influence not only what you build, but also how you build. Your talents are the lens through which you look at the world. They guide how you frame problems and they inform the solutions you generate for those problems. Your talents affect what you perceive as roadblocks and the methods you use to clear them. They influence how you identify your goals and aspirations and the route you take to fulfill them. So, now that you know your builder talents, then what? Gallup has discovered that self-awareness is very important, especially for builders. But you must also know how to apply it. Builders can use the self-schema tool in Born to Build to create a blueprint of their personality and get more insight into their behaviors. When you focus on what you're good at -- your natural talents or strengths -- your brain experiences what we call the strengths advantage. You think more clearly, learn faster, your energy levels rise, you becomes more productive, you can work longer, and you're happier and less stressed. Gallup's research from 43 studies across 22 organizations representing 1.2 million individuals and 49,495 business/work units shows that when people and teams use their strengths, there is about 9% to 15% increase in employee engagement, a 14 to 29% increase in profits, and a 10% to 19% boost in sales. Knowing what you're good at suggests talent areas in which you are likely to see superior performance. This is where you should focus your energy. Our research indicates that starting with self-awareness gives you the best chance for success. The 10 builder talents don't address every factor that affects a builder's success. But they explain who you are, what you can do and what you believe you are meant to do. The assessment and blueprint can also help you make a plan, build better teams and predict your future in whatever uncharted territory you decide to explore. Recognizing opportunities is the second key of building, and the topic of the next article in this series. Learn what steps you should take to test your business idea in the real world. There's no shortage of innovative ideas in the U.S. What the country really needs is more entrepreneurs starting new businesses. Is it time for you to build something? Learn More about Is it time for you to build something?